If you are looking for a tasty vegetarian pizza, then look no further. 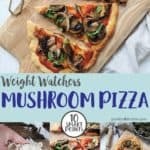 This delicious, easy to make Mushroom Pizza is 10 SmartPoints on Weight Watchers Freestyle / Flex program and that is for the whole pizza! 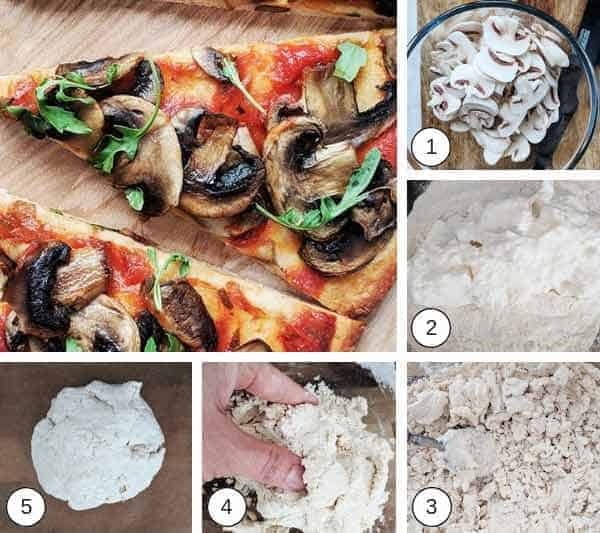 Read through the post for tips on how to make fail proof 2 ingredient dough pizza crust or jump straight to the recipe if you prefer. I love this 2 ingredient dough! It is so versatile and can be turned into lots of tasty low point snacks, pizza crust being one of my favourites. Sometimes I just don’t want to share my pizza (read that as I never want to share my pizza) and I certainly find it impossible to have just one slice. That is why I like this recipe so much – a whole pizza for 10 SmartPoints! No it doesn’t have a cheese & pepperoni laden topping and no it isn’t 12 inches in diameter, but it’s still pizza, it still tastes fantastic and it’s not a gazillion points! Gazillion point pizzas are part of the reason that I started on this Weight Watchers journey and do you know what, I no longer really miss them. That’s partly due to having found the 2 ingredient dough recipe! For an easy (and point saving) way to cook the mushrooms, slice them thinly (pic 1), cover and microwave them for a couple of minutes. This means you don’t ‘waste’ points by frying the mushrooms in high point oil or butter. Use a thick fat free Greek yogurt such as Fage to make your dough. Using a ‘thinner’ yogurt can make the dough sticky and unmanageable. Sometime the thicker yogurts have a bit of watery liquid sitting on top of the yogurt. This is totally normal, but I would suggest draining it off (rather than mixing it into the yogurt) before adding it to the flour (pic 2). To begin with, use a spoon to combine the flour and yogurt. It will start to clump together as in picture 3. You can then use your hands to bring all of the mixture into a ball (pics 4 & 5). The dough should not be too sticky and shouldn’t sticks to your hands. If it does, flour your hands. I would highly recommend using a set of scales to measure your ingredients rather than using cup measurements. Place the dough on a sheet of baking parchment or even better on a silicone mat if you have one and use your hands to shape the dough. I love my silpat silicone baking mat, which I purchased from Amazon and use it for all my sweet and savoury baking, including pizzas. I can’t stress how beneficial kitchen scales are when making this dough over using cup measures. These digital OXO scales with their handy pull out display are really good and are available from Amazon. Use a selection of zero SmartPoint toppings, such as sliced sweet peppers, sliced onions, sliced tomatoes etc. You can use a ready made pizza sauce instead of making your own but be aware that some will need pointing. If you love cheese on your pizza, try some of these Low Point Cheeses but remember to add on the extra points! If you liked this recipe you may like this Four Seasons Pizza. Or how about these Dough Balls or these Garlic Naan Breads. 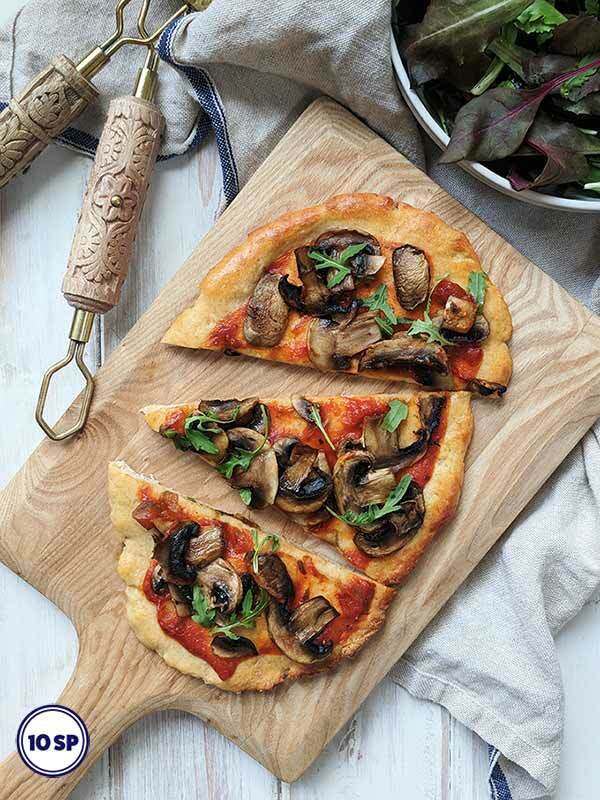 This mushroom pizza is 10 SmartPoints on Weight Watchers Freestyle / Flex plan. Preheat the oven to 200oC / 400oF /180oF. Put the passata, garlic, salt and pepper in a small saucepan and heat until it starts to simmer. Simmer for a few minutes until the sauce starts to thicken slightly. Remove from the heat and set aside. Place the flour and a pinch of salt in a bowl. Add the yogurt and stir using a spoon until the mix starts to come together. Discard the spoon and finish by using your hands to bring the dough into a ball. See tips section for more information about making fail proof dough. Spread a piece of baking parchment (or a silicone mat) on to a baking sheet and place the dough in the middle. Use your hands to shape it into an oval about 6 inches long. Place on the middle shelf of the oven and cook for 6 - 8 minutes until it is just beginning to colour, then remove from the oven. Whilst the pizza base is cooking, thinly slice the mushrooms, season with pepper and place in a microwaveable bowl. Cover tightly and cook for 2 or 3 minutes until they are tender. Stir half way through. 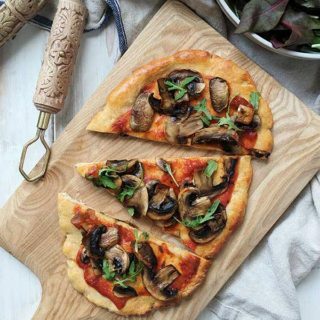 Spoon the tomato sauce over the pizza base, leaving a gap around the edge and then top with the mushrooms. Use 3 or 4 'pumps' of spray oil over the mushrooms before returning to the oven for a further 6 - 8 minutes or until the crust has turned golden brown. Top with rocket and enjoy!